The disease is caused by one of two protozoa, Sarcocystis neurona or Neospora hughesi. Almost all infections are caused by S. neurona, so this name is used throughout the web site. Both infections are treated with the same drug protocols. The life cycle of S. neurona is dependant upon the opossum. This makes the disease naturally occurring only where the opossum lives, North and South America. A horse becomes infected by ingesting the protozoa in feed, hay, pasture or water contaminated with opossum feces. In many of the infections, the horse can mount an immune defense and clear the protozoa from the blood before it crosses the blood brain barrier. The horse may carry an antibody to the protozoa for life. This is referred to as exposure to EPM, and is not an active infection. Exposure to the EPM protozoa will not cause neurological symptoms. In many of infected horses, the protozoa are able to cross the blood-brain barrier, and infect the central nervous system (CNS). They live inside of cells in the CNS, and are not detected by the immune system. Stressful events such as injury, extensive trailering, show schedule, pregnancy, or poor nutrition can suppress the immune system allowing the infection to flourish. As the protozoa reproduce, they break out of the host cell, and spread to other areas in the brain or spinal column. Protozoa activities cause lesions to form in the CNS creating the visible neurological symptoms. Researchers cite the incubation period of EPM as weeks to two years, until outward symptoms appear. The sooner the disease is diagnosed and treated, the better the prognosis. Left untreated, the symptoms generally progress until the horse is recumbent, and most untreated cases end in death. I’ve had many people contact me about their EPM horse and if I can help. I always have to answer with, it depends! Lucky for me and my clients, I’ve never had to say no. 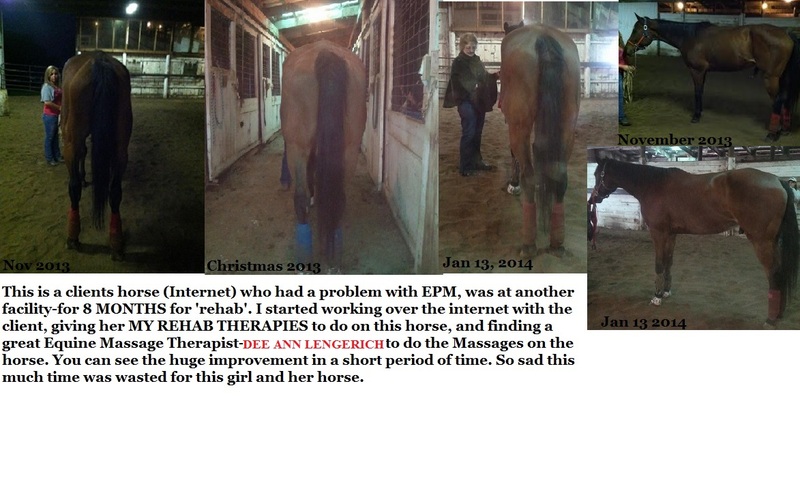 I’ve always been able to help an EPM affected horse recover from it, and several of my students as well! 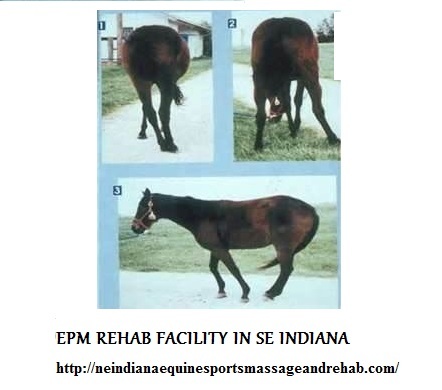 It’s also been found that EPM usually attacks the right hind of the horse. It is never both sides. If a horse is atrophied on both sides, there’s something else going on. Once the horse has been diagnosed and treated by a vet, that is where they usually stop the treatment, but most times some damage has been done to the horse, from muscle atrophy, and nerve deterioration. Using different tools along with Massage to help with circulation and the nerve deterioration helps to get the feel back into the affected area. 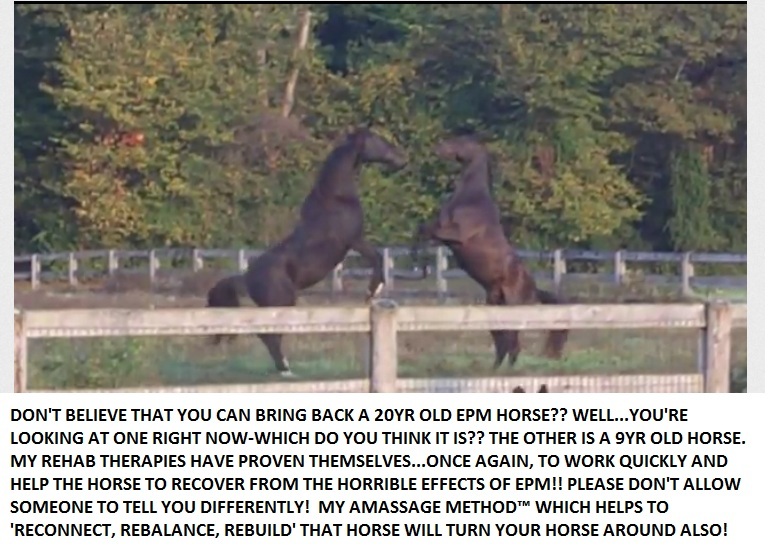 Massage alone cannot help, you need to do several other therapies to get the horse better. If you’re ‘therapist’ is not doing these, then they are not doing everything they can to help your horse. Please contact me or one of my CERT students for help. The horse ‘Rebounds’ very quickly with the Groundwork that is done! Helping the horse to get the Muscle Memory™ back for Balance and Coordination! ReBuilding the horses muscles to get them strong! Learn how to help these horses get better, fast! ReBalancing the whole horse to help them to get and stay strong and healthy. Want to learn more about me and my School for Equine Massage-Midwest Natural Healing for Animals-EPM Strategies for Rebounding is taught in Level 3!